I seem to have a bit of a blindspot when it comes to remembering this blog's anniversary for some reason. This year I'm about two month's late and since it is the third one, I did want to acknowledge it as I'm happy to still be here. I realize I can be a little all over the place with my post topics but that is a reflection my interests. I tend not to get too personal cause I have no intention to use this space as my diary and my everyday life would probably be quite boring to read about. I'm thankful for this blog as it has been a creative outlet which has allowed me to express, learn and connect with so many incredible fellow bloggers and readers. I went back into my archives and pulled up some of my earlier favorite posts and I hope that you'll visit one that catches your interest and come back to let me know your thoughts on it. One of the best things about this blog is having you all share your perspectives with me. A peek inside my closet at my sweaters. I really do love color during the colder months. My mitten collection... Let's just say I have a real fondness for them. A look at the contents of my bag. I'll be working on an update on this soon. It should be interesting to see the changes. and took a selfie. I really need to bring these two back but see more of them here for now. Talking about savory oatmeal which is the pretty much the only way I ever eat it. The first eye candy post here featured the lovely Han Chae Young. Visiting the Chanel Little Black Jacket exhibition when it hit town. Talking about my love for tv show White Collar and the time I took this photo of Matt Bomer. A Dine Out post on the famed Le Bernardin restaurant in NYC. Some of my photos of snow in NYC and my love/hate relationship with the stuff. My first and only outfit post. Happy anniversary Rowena! 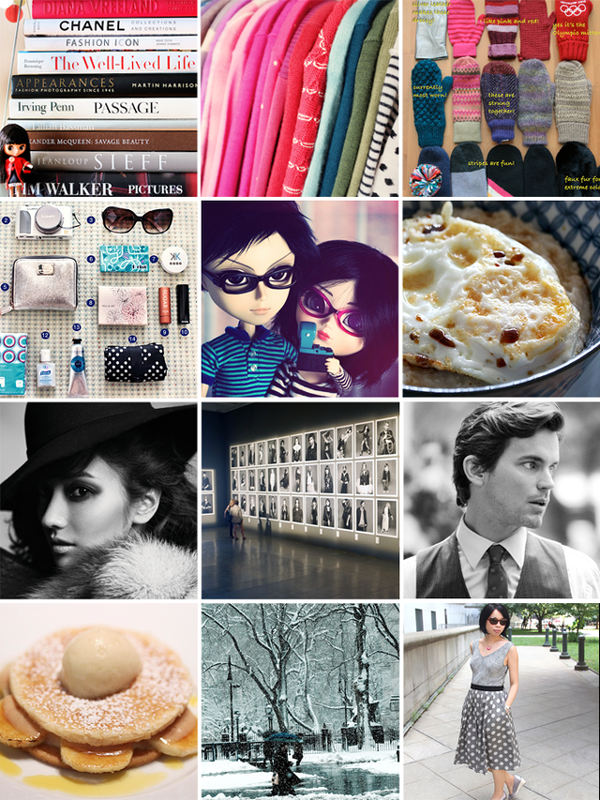 What a lovely selection of posts you have shared - I love the outfit post, you look beautiful! Happy blog birthday, Rowena! And what a fun idea to add some throwback links! Happy Blog Anniversary and continue the amazing job you do also enjoy visiting. Belated happy blog anniversary, Rowena!!! Woot! Happy belated third blogaversary Rowena! This is your only outfit post, really? You looked marvelous. I love the dress. I wish you would post more outfits. That pic you took of Matt Bomer is fabulous. I have watched the show and I really love it. It's not on tv right now, sadly. Have a happy Monday sweetheart!! I LOVE your sweater collection. I would SO make you try on a bunch for me. 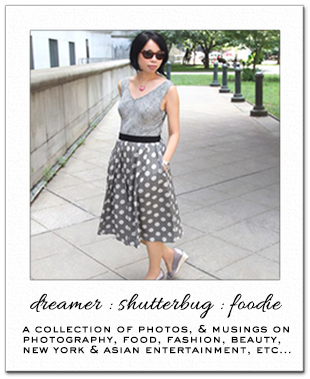 Belated happy blogaversary Rowena. Awesome pictures, esp the one of Matt Bomer, white collar was one of my favorite series too. And now Happy Monday girl. congrats dear! your photos are amazing. Happy Blog Anniversary Rowena! Please continue to share your beautiful photos with us. Congrats for your great job Rowena... I love your blog!!! You have a fantastic blog! Happy Blogiversary Rowena! Congratulations on your blog anniversary! For my first couple of blog anniversaries I forgot the date too (actually, I don't even think I made a post for my second year anniversary). These things tend to sneak up on you lol! I always miss mine too, I think I had my second year not long ago. Happy blog anniversary. Love your awesome blog. Hey congrats on reaching this milestone! I know I always forget mine too. I will have to get to LE BERNARDIN! I am still trying to get to The Dutch. Happy Blog anniversary, Rowena! Keep up the great job, girl, you're definitely one of my top favourite blogger! Happy Anniversary Rowena! Time goes by so quickly! I've been following your blog for a least a couple years;) i always enjoy visiting and appreciate your creative posts! Happy Blog Anniversary Rowena! You're like a diamond! So multi-faceted! I love that you cover different topics. I always find everything you post interesting. You know Rena and Ian hold a special place in my heart. They were the first things I noticed about your blog. I instantly fell in love. Love your features on NYC. Love the fashion editorials you feature. Excellent beauty reviews. It's all awesome! Keep it up! i remembered the first few anniversaries, but forgot them the past couple of years. in fact, i just missed it again (sept)! rowena, congrats on your anniversary!! Am so glad you recap your old blog post because they are really awesome. I love the chanel exhibition one as the styling for all are so inspiringly beautiful. It's amazing how just a LBJ can do to a person's look, if done well. It must have been quite an experience, being there in person to take it in, all. Nothing beats being there! Like watching a concert sort of feeling. Your NYC snow captures are truly marvelous! I know by now you have a love/hate relationship with it, am sure I would probably feel the same if I ever stay in NYC, haha. Not that fun when it's slippery and dirty *_^ But having said that, you captured the most beautiful side of snow. Your food captures always make me want to eat even more! haha (not good for my waist line, heehee). Of course, I absolutely love your eye candy posts, that is what got me started my version of star gazing, though yours are way better, I feel. Above all, I truly treasure the "virtual" friendship that I have come to experience, exchanging ideas and thoughts for things that we both love and passionate about, reading about each other's life experiences along the way. I guess that's what blogging is really all about after all, connecting with light minded fellow bloggers and hopefully, cementing a long lasting friendship along the way! Congrats again and keep the good work coming *_^ Hope this virtual friendship will turn into a real one, when we finally meet face to face one fine day! yay. Happy Blogaversary! Great that you're still enjoying it. I like your blog for all your pretty pictures and you keep me in touch with Asian pop culture. May we continue to be inspired and keep meeting interesting minds in this world. YAAAY! Happy anniversary to your blog, Rowena! Hope to see more updates from you! Congrats for the anniversary of your blog, the truth is that I have not done anything for my anniversary, I sometimes forget but I hope to do something next year, you have a varied and interesting blog do not forget to write Rowena! Kisses. Happy blog anniversery...so your blog is a toddler now:) Many happy returns<3! I think my thirst anniversity is about this time (maybe it even passed already) too! I think that there is no need for us to make our blog fit some norm...I like and read all kinds of blogs, not just ones that focus on one subject...and on my blog I post about whatever I feel like posting. Happy Blog anniversary dear... keep inspiring us! Happy Blogiversary!! We are so happy to have met you through blogging! Aww happy 3 years on blog land! You're just like me. My 3rd was last month and I am yet to do anything special. Was thinking of maybe doing something next month though since it's the silly season and I don't think I'll have the time to do something with a bang! Happy Blog anniversary and wishing you more wonderful years of blogging. Have a great weekend. I must congratulate you for your beautiful and unique blog. It is one of the most aesthetic, well-balanced, and genuine blogs that I know of. Sorry for my lateness but want to wish you a happy blog anniversary. I always enjoy coming to visit you and thanks for all you share and all the kind visits to my blog. Congratulations!!! This is another wonderful milestone! You do a lovely job and I share your love for this blogging world. I am so happy I found you here!